NEOMED – Sheffield’s latest arrival offers a taste of the Mediterranean to all who embrace it. NEOMED is a brand new restaurant in the heart of Sheffield – which serves up delicious Mediterranean dishes, ranging from pizzas to homemade bread and pasta! NEOMED chefs bake outstanding sourdough in their bakery, and the NEOMED coffee lounge offers a relaxing place to sit. NEOMED is open for breakfast, lunch and dinner. 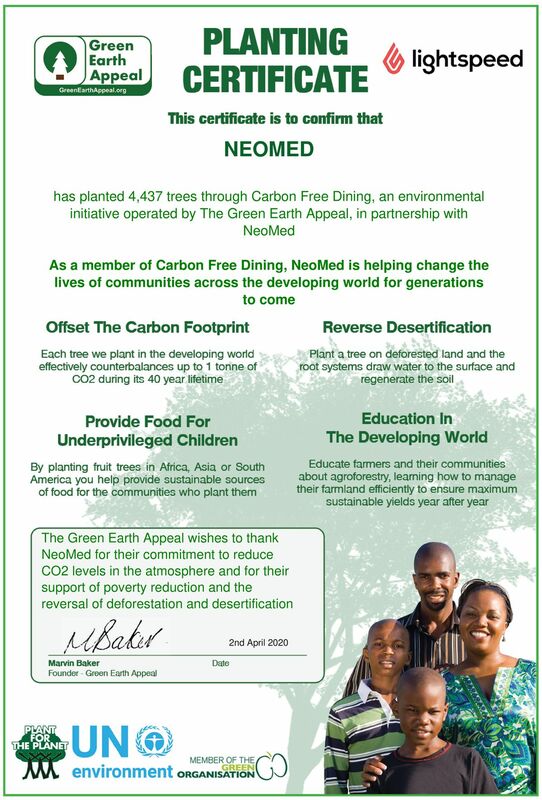 Now, NEOMED has teamed up with Carbon Free Dining, the United Nations-backed Restaurant initiative. They have chosen to demonstrate their love for the environment by partnering with the programme. As a Carbon Free Dining Certified restaurant, NEOMED plants hundreds of trees each month, effectively offsetting the environmental impact of the meals it serves. This is done by simply giving diners the opportunity of planting a single tree with each bill for an optional 99p.